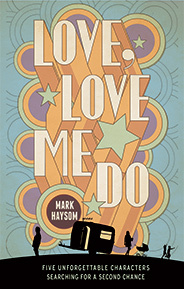 ‘An astonishing debut, ‘Love, Love Me Do’ is utterly original, completely unique, deeply touching and has a universal appeal that will resonate with men and women alike.’ Piatkus. It is 1963. The year the Beatles first top the charts. The year Martin Luther King has a dream. The year Truman Bird moves his family from their home in Brighton to a dilapidated caravan in the Ashdown Forest – then disappears. For Truman’s wife, Christie, life has not turned out the way she’d imagined. How has she, that young girl of not that many years ago, ended up like this? In a caravan. With three children. And an absent husband. Honest and unsettling, yet ultimately uplifting, this unique, wise and addictive British debut weaves themes of love, betrayal, family and childhood, and shows that even though life has a habit of getting in the way of dreams, people find their own extraordinary ways of bouncing back. LOVE, LOVE ME DO is available as a paperback and as a Kindle edition. ‘In a story of laughter and tears, Haysom takes us on one family’s journey to achieve their dreams, and shows us that for every lie and secret in every family, there is also a love. And in the end it’s love that counts.’ Piatkus. Baxter – the first Bird to go to university. It’s fresher’s week and a new beginning. But his past isn’t ready to let him go. And worse, it’s followed him right into the lecture hall. Christie – haunted by what’s gone before and held back by heartbreak. But with her son succeeding against the odds it’s now her turn to follow her dreams. Until the husband she’d thought she was rid of walks back into her life. Truman – husband to Christie and father to Baxter. After a ten-year absence he decides he’s owed a second chance. And to help him on his way he’s found a golden key that will open every door. Or so he believes. 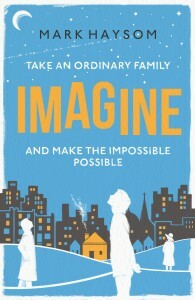 IMAGINE is available as a paperback and as a Kindle edition. Maude: A really enjoyable book and a compulsive read. I was intrigued by the timeline which was unusual and took a bit of getting used to but it worked well. Very evocative of its time and place. Well constructed and I am looking forward to the second book. RF: This book is razor-sharp with flashes of style that pay homage to the best of Greene or Hemingway. I was gripped from first to last and warmed strongly to the two heroes, Baxter and Soldier, and the obvious heroine, Baxter’s mum. As intended, my dislike for Truman was deep and intense but the book is all the more engaging for that. For a first-time novel Love, Love Me Do is a sure-fire hit and I think the author’s new career may prove to be his best yet. ST: This is an excellent book that I could not put down. It’s well written and keeps you guessing until the end. Can’t wait for the next one to arrive. Burmilla: An excellent book, particularly if you lived through the 60’s and 70’s. You get really involved with the characters, and the story is indicative of the period. Can’t wait for the sequel. HC: Just finished reading this book. I thought it was a real delight. Thoughtful and thought provoking; commendable, even elegant, lightness of touch and turn of phrase in the prose; clever evocation of an era and a place; the characters felt alive and real – not developed (just) for the sake of the story. I am no expert on author debuts but this seems to be a very good one. JO: Loved this book – it captured the people and times of the late 50s perfectly. Such a clever idea to set the action across one day. You do want to shake the heroine for believing her feckless, delusional husband – but this is a really clever book. Looking forward to more from the author. ***** Read read read – could not out it down! MPJM: This book will capture you and take you on a journey in the intertwined lives of 5 people – you will identify with one or more of the characters whilst not the others yet the next person may feel differently. – leading to an interesting mix of potential interpretations. But read it for sure – one of the best books I’ve read this year – I read it in three sittings, such is the need to find out the denouement! SS: I finished this book in two sittings, and am already anticipating the sequel. Beautifully paced and with the characters well drawn, it is engaging from the start. Highly recommended (a great holiday read). CL: A fabulous story by a great storyteller! The first time this year I have wanted to share a book with friends… Have pre-ordered and know they will be enjoyed as much as I did. JL: This was a great read and beautifully written. It made me sad but left me hopeful. One of those books that I just didn’t want to put down. I would really recommend it as a holiday read. LD: This is a wonderful wonderful book, one that I read from cover to cover in one sitting, keen to find out what happened next to the characters that felt like friends I had known forever as they came alive in my mind through Mark Haysom’s beautiful writing. I can only hope that there is a follow up novel so that I can meet my new friends again! ME: If this were just an exercise in technique – the crafting of characters through individual voices, the layering of plot through differing perspectives on the same events – it would be an impressive debut in itself. But to that add the capacity to create a lived experience of a day in the 60s that resounds in the imagination of the reader. And then suffuse it with a capacity genuinely to feel what it is like to be variously a child, a feckless young man, a disappointed woman at a time when it might just be possible to have a different life….and many more. This is an accomplished and deeply human work which is also a cracking read. The hint that there is more to come is more than welcome! MJ: From page one you are drawn to the characters one by one and as the story unfolds and their involvement in it is revealed this book is impossible to put down. Truman, living on his wits on the edge of disaster and you know always will be. Christie, Doll and Sal, gullible women looking for and failing to find happiness and security in the fast changing society of the sixties. Soldier, Damaged by the country he served that let him slip through the net but with strong principles of guardianship for the young and the vulnerable. And my favourite character, Strachan with echoes of Graham Greene’s character Pinkie Brown, a fading hard man from Brighton, Britain’s one time capital of crime who knows his time is running out. Evocative references to contemporary music of the time enhance the atmosphere of nearly fifty years ago. A remarkable first novel with a tantalising snippet of what’s to follow in the next one. Can’t wait! IG: Sometimes you come across a book that you say you cannot put down – but when you pick it up again it takes time to rekindle the images. Not so with Love, Love Me Do. The characters stay living with you when you put the book down and immediately speak to you when you go back to it. They are warmly and expertly drawn, they exist both separately and together which makes the whole experience of reading it a remarkable pleasure. JW: I read this whilst on holiday & I could not put it down. It is beautifully written. I loved the way each chapter concentrated on just 1 of the main characters so you really got to know them. Each character evoked a different emotion – sympathy, admiration, anger, frustration, love & I did not want the book to end. Very happy to see that there will be a sequel. KB: From the first chapter I was hooked. The characters are compelling. You want to hug them, shake them, scream at them, rescue them, cry for them and punish them. I’ve stopped reading about them but they are still with me. It’s cruel to keep us waiting to find out more about their lives. Hurry up and let me read more! CM: Absolutely loved this book. I would disappear to somewhere quiet and loose myself for an hour. Very difficult to put down. Each character draws you in, wanting to know more about them. You go through every kind of emotion reading this and I was saddened when I had finished it! Really looking forward to the next one. Very special indeed. AN: Can easily see why this author is attracting a lot of positive attention. This is an unputdownable and sensitively written atmospheric page turner, featuring a delicious range of characters you come to care for, and one that leaves you speechless, caught up in an absorbing struggle to survive. Cleverly written, full of tantalising detail and interesting twists to the end, it’s one of those captivating books you are sorry to finish. This guy is a really exciting and fresh, five star ‘storyteller’. Really looking forward to his next. SF: One page in and I was hooked! The character building was seamless and authentic. This book will connect with anyone with memories of the 1960s, when things were just a little different, when the things we take for granted today were aspired to! The interwoven story lines created and maintained tension, sufficient to keep the reader absorbed but never pushing boundaries for the sake of it! Memorable! GB: Finished reading this wonderful first novel – couldn’t put it down!! An unpredictable story line kept me up late. Can’t wait to pick up the next book how early can a book be pre-ordered? *****Didn’t expect a novel to stop me painting! JW: From the word go I felt part of the plot, an onlooker wanting to know more. Set in my formative years and in an area I know well; the musical references added credibility and promoted fond memories. Not known for my total involvement in many novels this made me consider the social history of the 60’s, empathising with the individual characters. I have already suggested it as the next book club read. MWR: I don’t think I’ve come across a book quite like this before – the Amazon blurb says it’s unique and it really is. It was recommended by a friend and I got it on Kindle this morning and was hooked from the very first page. I have been reading it now almost non-stop. It carries you back to the 1960s and it is a book that makes you laugh and then cry – sometimes within just a few lines. It is a story about so many things – lies, hopes, dreams, love, music, violence, barmaids (! ), and the life of a young family abandoned in a forest. There are five main characters and they all get inside your head. Once you have read it, you are bound to have a favourite. Mine is Baxter – simply heart-breaking. But I also can’t wait to get to the next chapter about Truman! One of our readers was asking for your new novel. When will it be published?